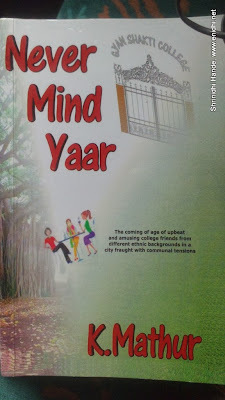 Never Mind Yaar is a ficton that covers college life, Mumbai and of course young romance. Story revolves around the life of 3 girls and a boy who've joined Mumbai's prestigious college, Gyan Shakti. The 3 girls, namely Binaifer Desai, Lauella D'Costa and Shalini Dayal, from different backgrounds (Parsi, Christian and Hindu), become friends on day 1 of the college and continue to be so till the end. Within few days Shalini seemed to developed likings for a guy named Bhagu in their class and the other two girls take as their life's mission to unite these 2 (Shalini and Bhagu). Bhagu's character begins as normal but soon turns heroic. He is hailed for his debating skills, and his courage to take on the canteen wala chacha, who's been making money compromising on quality and quantity of food served. Chacha is apparently leader of a slum and was mixing water to milk and cold drinks to make more money. Bhagu's signature campaign against the canteen's poor state of affairs gets him beaten by Goondas, but post recovery, makes him a hero. Meanwhile Bhagu's love affair with Shalini continues. Shalini's grand mother in Jaipur has found her a perfect match and no one dares oppose the granny. Shalini prefers to elope with Bhagu and get married, since her parents and grand ma would not even consider a poor jobless student as a groom over other rich prospects they have shortlisted, but Bhagu wishes to get introduced to the family and marry her with the blessings of her parents. Their secret love affair is not yet known to family members and their disconnect on the way forward creates a gap. Bhagu gets fully involved with a upcoming political party and has less and less time to worry about marriage. Story happens in 1990s and adopts the then real life events like Mumbai serial blasts, communal riots nicely. Author explains in clear details, the mind set of young minds, dilemma over crucial decisions like love and wedding and so on. The most interesting part of the book is in the end. Did Shalini and Bhagu escape and marry? Was Shalini forced to forget Bhagu and marry someone else or did some magic happen to unite them? Do read the book to find out, because my revealing the end would spoil all the fun. Never Mind Yaar is written by K Mathur, a New Zealand based author K. Mathur. This being her first book, it is a very good attempt with nice narratives, detailing and characterization. Apart from the story, getting to know some debating tips & styles is a bonus. Another thing to be noted about the book is that many of author's friends seemed to have pitched in to help. Cover design and other art work seems to have helping hands of friends. However, I couldn't find enough justification to the title. Author says 'Never Mind Yaar' is an attitude. However, in the story, students did revolt against the pathetic canteen, Bhagu & Shalini did contiune with their romance till the very end, they do deal with other challenges.